Taking some time to reflect, I can’t believe we are already at Week 7. The season seems to be flying along and this is some of the most fun I’ve had watching the Kansas City Chiefs in my lifetime. Welcome back to chiefStats, where we cover a few statistical topics leading up to the Chiefs games. Last week, we asked the question of whether or not Tom Brady was finally on the downswing. Unfortunately for the Chiefs, Brady answered that question by showing us he still has plenty left in the tank. Now let’s see what kind of dirt we can dig up on the Bengals. I had remembered hearing rumors about how the Bengals quarterback, Andy Dalton, struggled in clutch situations. I have no idea where I had heard this, and I honestly could have just imagined it. Either way, I found some pretty interesting information regarding Dalton’s day/night splits. Dalton has played significantly worse in night games than in day games. This situation has led to some pretty hilarious nicknames for Dalton like Daytime Dalton and Daywalker Dalton. Notice the eight-point drop in passer rating? That’s the difference between Aaron Rodgers (100.1) and Alex Smith (91.9) so far in 2018. I know Smith is a good quarterback, but I’d much rather face Smith than Rodgers. But it’s not all Dalton’s fault. In fact, the Bengals problems at night go beyond Dalton’s era with the Bengals. Marvin Lewis has coached the Bengals since 2003. He is 1-8-1 in Sunday night football games for a 0.100 win%. In all other games, Lewis and the Bengals have a 0.542 win%. Marvin Lewis has not put forth good showings on Sunday Night Football games during his time in Cincinnati. I was surprised to see Lewis has been coaching for the Bengals since 2003. At that time in my life I was a junior in high school and probably sitting in my parents basement playing the Gamecube (seriously underrated system). As the season progresses, it is becoming more and more clear that if teams want to beat the Chiefs they will have to win in a shootout. In shootouts, teams who settle for field goals more often usually lose. This is why red-zone performance will be a key stat for every Chiefs game going forward. With the current version of the Chiefs team, all that stuff between the 20-yard lines really doesn’t matter. Once again, we’ll be using Bill Connelly’s advanced stats guide. Looking at the matchup between the Chiefs red-zone defense and the Bengals red-zone offense, it appears as though both teams are evenly matched going into this game. This tells me anything could happen when the Bengals are in scoring position. If the Chiefs want to win, they are going to need to hold the Bengals to field goals. Looking at both teams’ numbers, it could be a coin toss every time the Bengals get into the red zone. When the Chiefs have the ball in the red zone, they have a large advantage against the Bengals defense, which hasn’t been particularly great in the red zone. With the Bengals offense evenly matched with the Chiefs defense in the red zone, and the Chiefs offense being significantly better than the Bengals defense in the red zone, we could see a game where the Bengals simply can’t keep up with the Chiefs offense. The column on the right shows the Bengals third-down defense, and orange stands for bad. The Bengals third-down defense has been bad if you couldn’t tell. 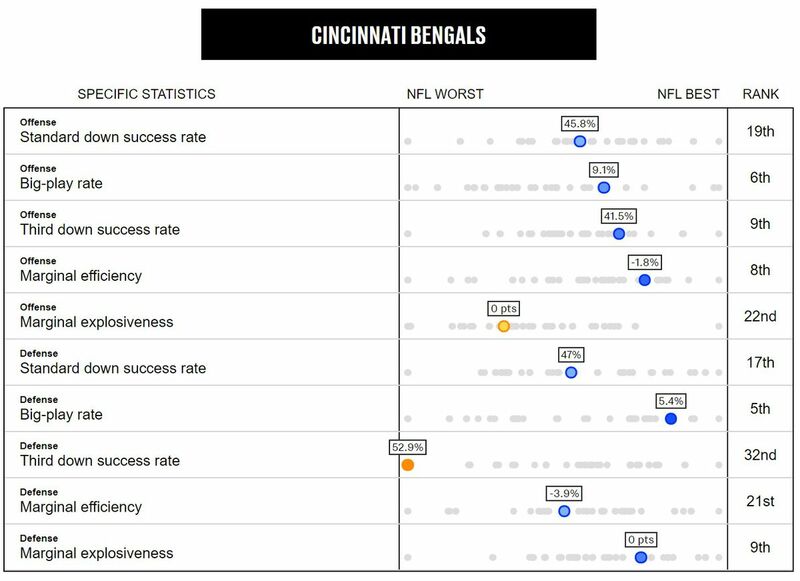 The Bengals rank in the bottom third in nearly every single success rate statistic as it relates to third-down defense. The Chiefs have an above-average third-down offense so far in 2018 and we could see the Bengals struggle to get off the field on third down repeatedly Sunday night. The Bengals defense has allowed the 3rd most penalty yards (408 yards). However, they also have the 10th most penalties. This tells me the Bengals’ defense commits big penalties like pass interference, personal fouls, etc. Penalties could be a factor tonight. With the Bengals defense having so many penalty yards, penalties could be a big factor in tonight’s game. The Bengals defense has also allowed the eighth-most first downs by penalty in the NFL. The way I see this shaking out is the Bengals defense will commit a dirty or late hit here or there, and their defense may also be susceptible to pass interference calls. This will definitely be something I’ll be watching for tonight. So ends this week’s episode of chiefStats — what are your keys to the game?